49. Veronica oxycarpa Boissier in Kotschy, Pl. Pers. Austr., ed. R. F. Hohenacker. no. 639. 1845, printed label with a descr. 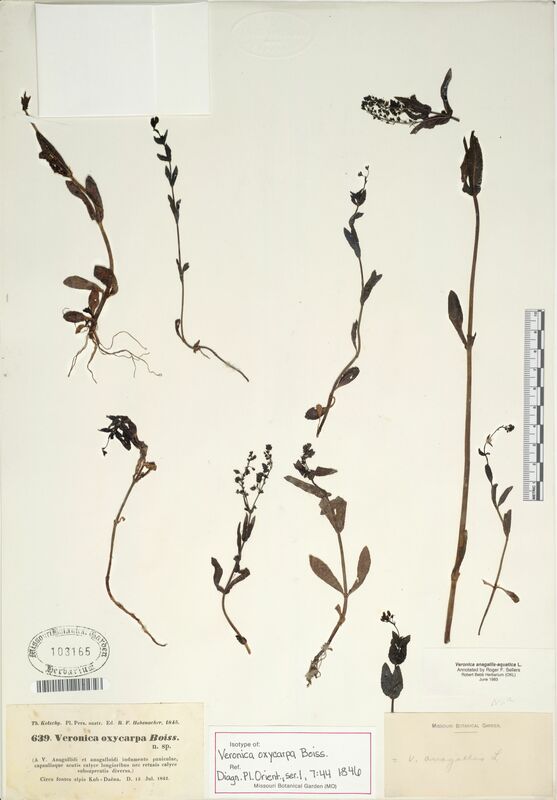 Veronica anagallis-aquatica Linnaeus subsp. 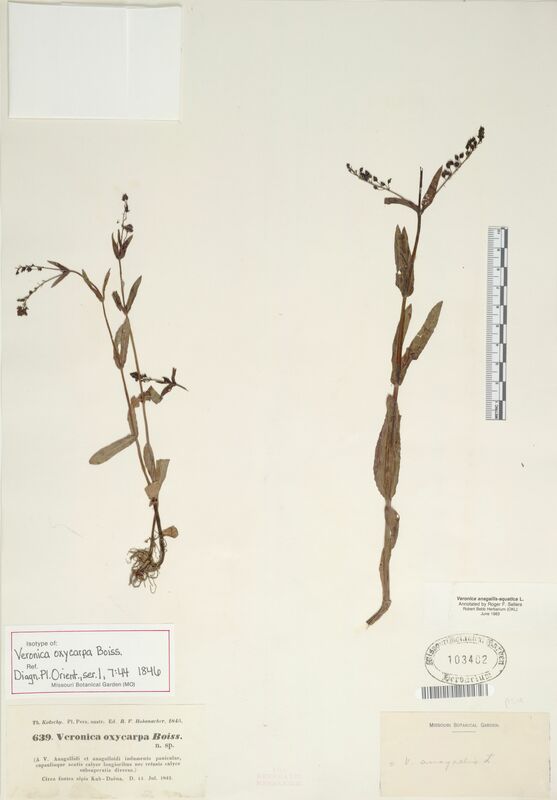 oxycarpa (Boissier) Elenevsky. Perennials, rhizomes often more than 20 cm. Stems 30-100 cm tall, erect or procumbent at base, simple or with procumbent branches, succulent, glabrous or apically sparsely glandular hairy. Lower leaves short petiolate, others sessile and semiamplexicaul; leaf blade ovate to elliptic, lanceolate upward, 3-8 X 1-3 cm, margin entire or serrate; leaves on branches smaller than others, short petiolate. Racemes axillary, many flowered, to 15 cm, often curved and ascending. Pedicel 4-10 mm in fruit, longer than bract, curved and ascending. Calyx 4-lobed, as long as capsule or slightly shorter; lobes ovate-lanceolate, slightly unequal in width. Corolla blue, pale purple, or white, ca. 6 mm in diam. ; tube short; lobes slightly unequal in width. Capsule ovoid-deltoid, slightly compressed, apically tapering, 3-4 X 2.5-3 mm, apex slightly notched. Style ca. 3 mm. Seeds ca. 30 per capsule, slightly flattened, ca. 0.5 mm. Fl. Jun-Aug. 2n = 18. By water near forests, open places near water. N Xinjiang, Xizang [Afghanistan, Bhutan, Kazakhstan, Kyrgyzstan, Pakistan, Sikkim, Tajikistan, Turkmenistan; SW Asia].